Increased ZEB1 expression promotes ocogenic transformation. Increased expression of zinc finger E-box binding homeobox 1 (ZEB1) is associated with tumor grade and metastasis in lung cancer, likely due to its role as a transcription factor in epithelial-to-mesenchymal transition (EMT). Here, we modeled malignant transformation in human bronchial epithelial cells (HBECs) and determined that EMT and ZEB1 expression are early, critical events in lung cancer pathogenesis. Specific oncogenic mutations in TP53 and KRAS were required for HBECs to engage EMT machinery in response to microenvironmental (serum/TGF-β) or oncogenetic (MYC) factors. Both TGF-β- and MYC-induced EMT required ZEB1, but engaged distinct TGF-β-dependent and vitamin D receptor-dependent (VDR-dependent) pathways, respectively. 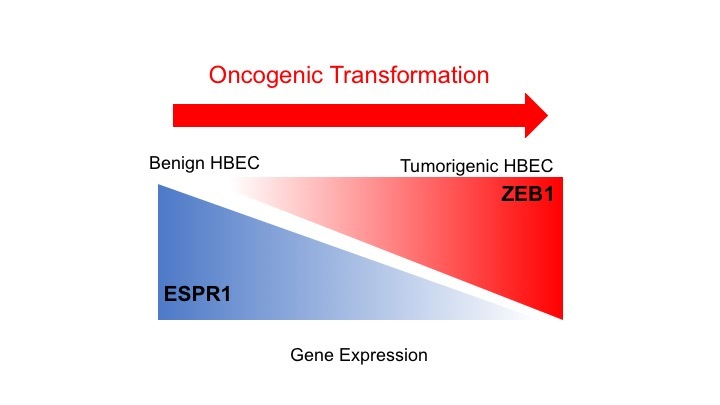 Functionally, we found that ZEB1 causally promotes malignant progression of HBECs and tumorigenicity, invasion, and metastases in non-small cell lung cancer (NSCLC) lines. Mechanistically, ZEB1 expression in HBECs directly repressed epithelial splicing regulatory protein 1 (ESRP1), leading to increased expression of a mesenchymal splice variant of CD44 and a more invasive phenotype. In addition, ZEB1 expression in early stage IB primary NSCLC correlated with tumor-node-metastasis stage. These findings indicate that ZEB1-induced EMT and associated molecular changes in ESRP1 and CD44 contribute to early pathogenesis and metastatic potential in established lung cancer. Moreover, TGF-β and VDR signaling and CD44 splicing pathways associated with ZEB1 are potential EMT chemoprevention and therapeutic targets in NSCLC.